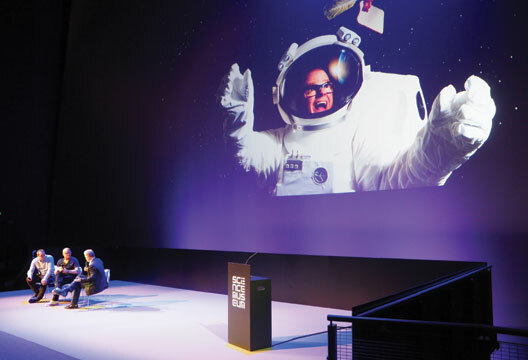 At the Science Museum’s spectacular IMAX cinema, the inherent psychological, biological and sensory challenges of human space flight were up for discussion thanks to a collaboration between the UK Space Agency and the Arts and Humanities Research Council (AHRC). With technological advances making space flight more likely for more people, Professor Barry Smith (AHRC Science in Culture Leadership Fellow) said we need to better understand space on a human level. Balance, a sense we often take for granted, particularly balance in a low- to zero-gravity environment, was the focus for Laurence Harris (York University, Canada), who took an experiment from lab to space revealing fascinating results. He explained that while on earth we use gravity and cues from our bodies and eyes to balance, in microgravity or zero-gravity situations these three things are thrown into flux. Who knows which way is ‘up’ while living on the International Space Station (ISS)? Professor Harris and colleagues expected that while in space astronauts would rely much more heavily on visual cues than while on earth – where the added benefit of gravity helps us orient ourselves. He has tested this effect on earth: having people lie down removes the gravitational pull on the long axis of the body, participants are then shown a letter ‘p’ slowly revolving. They then indicate when this ‘p’ instead appears as a ‘d’, revealing their ‘perceptual upright.’ When participants do this test lying down they use their vision to reveal where ‘upright’ is, much more than they do when standing. Harris explained the next stages of his work – having a DVD of his experiment sent to astronauts on the ISS. There were huge amounts of planning and red tape involved in such experiments being approved, and then when the DVD reached the astronauts it wouldn’t work! Thankfully, after some fiddling back on earth, seven astronauts carried out the experiment while in space – as well as before their journey and months after returning to the planet. While Harris expected to see increased reliance on visual cues to determine perceptual upright in the absence of gravity, this actually wasn’t seen. In fact, it seemed that in the time between arriving at the ISS and their first test, astronauts had recovered the ability to use visual cues to discern upright. However, the astronauts did rely more on their bodily orientation cues than they would on earth. Another interesting finding was that astronauts, even weeks after returning to earth, still relied overly on bodily cues in the task. As well as the senses, space plays havoc with the human body. Amazingly it’s only in recent years that astronauts have admitted that zero or micro gravity gives a majority of them motion sickness throughout their voyages. Similarly the effects of low gravity on vision are just being discussed with many astronauts admitting poor vision, which can persist for years after returning to earth. Professor Simon Evetts, Managing Director of SeaSpace Research, the research and development branch of Blue Abyss – a group that explores extreme environments, particularly space and deeper parts of the ocean – gave a fascinating tour of what space does to humans, from solar radiation to the deterioration of bones and muscles. Lauren Reinerman-Jones, Director of the University of Florida’s Institute for Simulation and Training, has been working towards recreating the feelings of awe and wonder astronauts often report while in space. She and her colleagues carried out several simulations in which subjects saw the earth as if from space. Participants’ readings on EEG, ECG and fNIRS were collected, as well as survey data on religiousness and more in-depth interviews about their experience. She and her team found differences between people who experienced awe and wonder in the simulation, including different theta and beta wave activity in their brains. Interestingly they also found that participants who scored highly on measures of religiousness and spirituality experienced less awe and wonder. In the latter part of the conference Libby Jackson (Astronaut Flight Education Programme Manager for the UK Space Agency), who was responsible for publicising Tim Peake’s voyage to the ISS, particularly to schoolchildren, gave an insight into his journey. Finally, food chemist and celebrity chef Heston Blumenthal was interviewed about the experience of developing meals for Peake to eat while aboard the ISS.